Keep your community and your car's ashtray clean with ash cache ashtray. Encourages responsible disposal of cigarette litter. Sturdy construction lasts for years of use. Extinguishes cigarettes in seconds and holds about 20 cigarette butts out of sight. If you have to smoke outdoors, simply carry this with you and keep your environment clean. Fits in car cup holders, so do not through your lit cigarette out the window and cause fires. Simply drop it in this ash cache and leave it. If desired sand or water could be added. Also great as a spill proof spittoon. Helps reduce ordor. Buy them in bulk for giveaways. 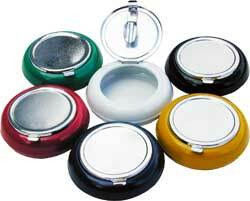 Attractive 4.5" ceramic ashtray specifically designed with rubber feet. so it will not slide. Black only.